Todd Energy is proud of the relationships it has with community groups and sports clubs across Taranaki, and we are pleased to support a number of those groups out on the green. In March, Big Brothers and Big Sisters (BBBS) Taranaki held a fundraising golf tournament at Ngamotu Golf Course in New Plymouth, and Todd was proud to sponsor a golf hole on the day. The annual ambrose golf tournament has been running for a couple of years now, and all funds raised go directly to local children in the Taranaki community who have been matched with a Big Brother or Big Sister, says Programme Leader Senior Constable Paul Lampe. 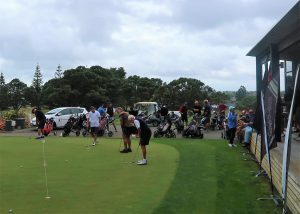 March also saw local New Plymouth primary school St John Bosco hold their annual ambrose golf tournament, with Todd not only sponsoring a hole but also entering a team to play on the day. The Todd Energy team at St John Bosco School’s annual golf tournament – from left, Alan Thomson, Pete Unstead, Mike Brophy, and John Nejedlik. With a total of 26 teams and 125 players, more than $14,000 was raised with all proceeds going toward the building of the school’s new playground. Back in April, New Plymouth Boys High School’s cricket club held a fundraiser golf day at Westown Golf Club to help raise funds to improve the school’s cricket facilities. 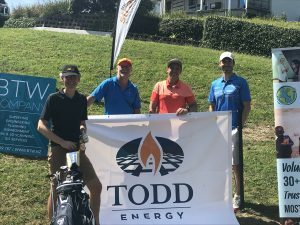 Todd Energy sponsored a hole, which included the entry of a 4-man team. “We always enjoy being able to support sports club and community groups that are fundraising for a good cause and are getting people outside and being active,” says Community Partnerships and Public Affairs Manager, Hamish McHaffie. Todd Energy has recently partnered with Te Ngutu Golf Club in Normanby. Through a 3-year sponsorship, Todd will be supporting the club with both its plans to upgrade the club house, as well as sponsoring junior coaching sessions, designed to encourage participation in the sport. The design for the club upgrade is currently being finalised with plans to commence work in the coming months. Todd Energy has also sponsored of the Manukorihi Golf Club in Tikorangi for a number of years and, more recently, supported the Urenui Golf Club in its purchase of a new club golf cart and cart shelter, enabling those less physically able to continue playing the sport they love.